The Independent National Electoral Commission (INEC) on Monday, March 18, said it will soon take its final stand concerning the controversies surrounding the Imo west senatorial district poll. Newsmen reported that INEC on Monday, March 18, again declared that it would not present a certificate of return to Imo state governor, Rochas Okorocha. INEC’s national commissioner, information and voter education, Festus Okoye, made this known during his appearance on. Okoye added that the electoral body took the decision because the returning officer for Imo West senatorial district election said that he declared Governor Okorocha as the winner “under duress”. 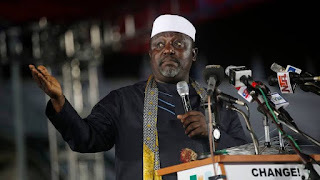 He said: “We’ve made it clear on why we didn’t present any certificate of return to him (Okorocha). “If you look at our website, we said that the declaration and return were made under duress and that we are not going to give any certificate to any person for any individual that procured a return under duress."